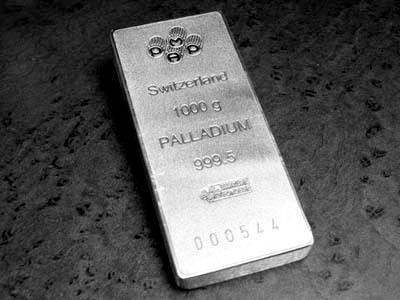 (Kitco News) - Analysts say that palladium prices may have been in “bubble” territory after the sharp rise since late summer, and some see potential for further weakness even after the metal shed 11% during the last two days. Spot palladiumm rose to a record high of $1,613.90 an ounce last week, a rise of 94% from the August low of $832.45. However, as of 10:32 a.m. EDT, the metal had collapsed to $1,362.55 an ounce. The metal lost nearly $100 an ounce on Wednesday. The percentage decline was 6%, and analysts say this was the biggest one-day sell-off since August. “Prices may have been in a bubble,” said Bernard Dahdah, Natixis precious-metals analyst, told Kitco News in an interview. Commerzbank analysts agreed in their daily research note. They pointed out that Wednesday’s slide was accompanied by unusually high trading volume, with 11,400 futures contracts exchanging hands on the New York Mercantile Exchange. Commerzbank said this was twice the daily norm. BMO Capital Markets and a desk trader both attributed much of the sell-off to profit-taking. This is occurring in commodities where market participants have profitable positions as the end of the quarter approaches, added the desk trader. Otherwise, he said, there is no fresh news to justify the move. Still, he added that he would be careful about trying to pick a bottom and buying again. Some analysts say the stronger tone in the U.S. dollar is hurting palladium at the same time it drags down gold. Many also cited worries about auto demand for palladium, particularly in China, which has become the world’s largest car market. The metal is used for catalytic converters. TD Securities pointed out that Chinese car sales are undergoing their most prolonged contraction on record. “Of course, palladium's supply woes and structural deficits have been noted and have not been a surprise to markets, although they have given market observers a reason to look past the deteriorating demand outlook,” TDS said. “Ultimately, we think prices will have to acknowledge that vehicle sales are some 15% lower and vehicle production is down some 17.4% as of February's data — despite signs of incentives in rural areas, which suggests market saturation. Further, Dahdah pointed to concerns about a slowing economy in the U.S., the world’s No. 2 car market. On Thursday, the government revised U.S. fourth-quarter gross-domestic-product growth down to 2.2% from the previous estimate of 2.6%. “Generally speaking, we are going into a global slowdown,” Dahdah said. Dahdah had looked for palladium to average around $1,250 an ounce in the second quarter but sees it below $1,100 in the fourth quarter. “Prices are well above where fundamentals suggest they would be,” he said. Nevertheless, he pointed out that whereas he sees prices falling some more, he projects they will be higher in 2019 than they were in 2018.